Compare the size of the Moon to the Size of Earth. How many Moons could fit inside the Earth? How does the Moon rotate and revolve around the Earth? Details for the lesson are in the handout. As the students were working, I visited each group to check on their progress and hear their ideas. I held off on revealing the real answers to the first 3 parts until everyone was done with all of the activities and after we discussed our ideas and reasons for the choices they made as a class. For the Rotation vs. Revolution, I had them try out their own ideas on how to make the penny rotate and revolve around the quarter before I demonstrated it with a styrofoam moon. For more lessons about the Moon, visit my Moon Page. To help students better understand the phases of the moon and it’s relationship to the position of the sun, both in the sky and in space, I created this hands on activity. I also updated it to include a Solar Eclipse scenario. Whenever I start an activity, I always call all the student to one of the student desks to discuss/demonstrate the lesson. We had been discussing the phases of the moon and reviewed the order of the phases as I placed the laminated moons onto the desk. I pointed out the crater Tycho and how it looks like the moon’s belly button. The ‘belly button’ always points towards the Earth (view from Northern Hemisphere), it is the southern part of the moon. This will help them to orientate the moon correctly when they go back to their desks. We completed the first scene together and discussed where to place the Sun and where to place the Moon, keeping in mind what rising and setting means, how we are looking at the landscape and reviewing Eastern, Southern, and Western parts of the sky. Once we have discussed the directions, students are ready to start. They can’t move onto the next scene until I have checked their work. Once it is correct, they draw the scene into their handout and move onto the next scene. When they were stuck, I reminded them to go over the hints, and gave extra hints if needed. For part 2, they had to show the phases around the Earth and what they look like from where we are standing in New Jersey. I reminded them to think of the spokes of a wheel and the Earth is at the center, and that we are looking from here on Earth out into space. Also reminded them about the ‘belly button’ always facing Earth. Also, if we were looking at the Earth and Moon from space, half of the moon would always be lit up – the side facing the Sun. Once the students were finished, we reinforced what we learned by making a moon clock that they got to take home and keep. Once they completed their moon clock, they learned how to use it and answered questions to demonstrate their understanding. This was a great follow-up to this activity. If you use this activity in your classroom, I would love to hear how it went. For related lesson plans, please visit my Earth Science page. 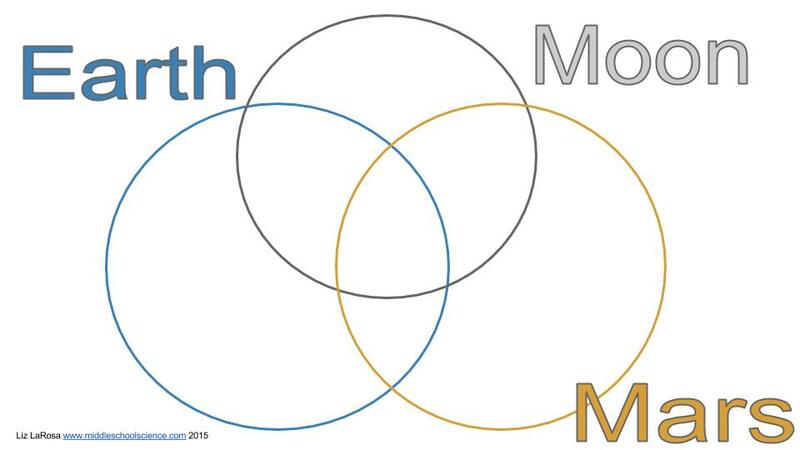 Birthday Moons – this is a classic lesson that has I have used over the years. I made a Birthday Moon Phases worksheet (pdf) for my students to use based on the original lesson (as of Aug. 6, 2018 – the original lesson is no longer posted on their website). We did this activity prior to the phases sort above. As part of our study about the moon, we have been observing the moon and practicing moon phase identification. 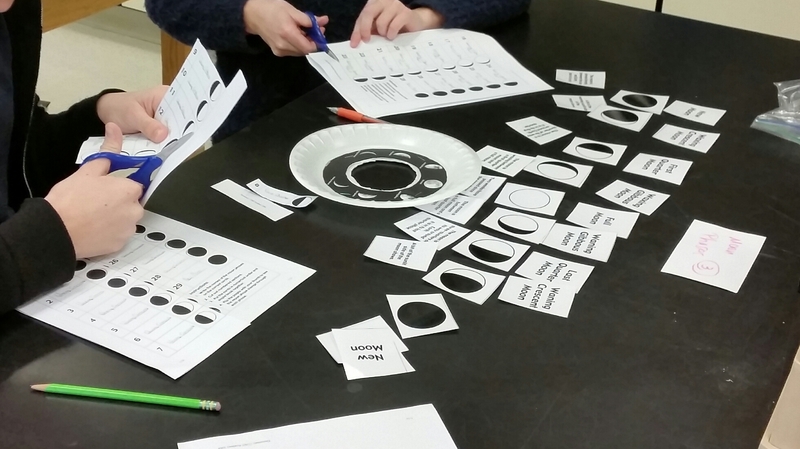 For the activity pictured above, students were given a moon phase finder, and laminated cards containing images of the phases of the moon, descriptions of phases, and the names of the phases. The handout included matching the names of phases and their descriptions and the template to create the moon phases flip book. Instead of stapling the flip book when done, we used a rubber band to secure one end. For the lesson, I started with a demonstration/explanation. Students would sort and match the cards first and then call me over to verify the phases when they were done. They self checked the descriptions by using the matching worksheet. I posted an answer key in the front of the room where they verified their answers/made corrections. Next, they used the cards to help them identify the 29 phases of the flip book. When done, they self check the phases with my answer key in the front of the room. Afterwards, they cut and assembled the flip book. I had small plastic bags and rubber bands for them to take home their pieces if they did not finish during the class period.